An Alaska Airlines flight had to return to SeaTac airport in Washington just minutes after taking off because screaming was reported from underneath the plane. A worker was stuck in the cargo area. The flight bound for Los Angeles had just taken off Monday afternoon, when the pilot reported hearing banging from beneath the aircraft, Alaska Airlines said in a statement. The captain immediately returned to Seattle-Tacoma International Airport. The plane was in the air for 14 minutes. Medics and rescue workers responded to the aircraft after it landed, discovering a ramp agent inside the front cargo hold, which is pressurized and temperature controlled, according to the airline. 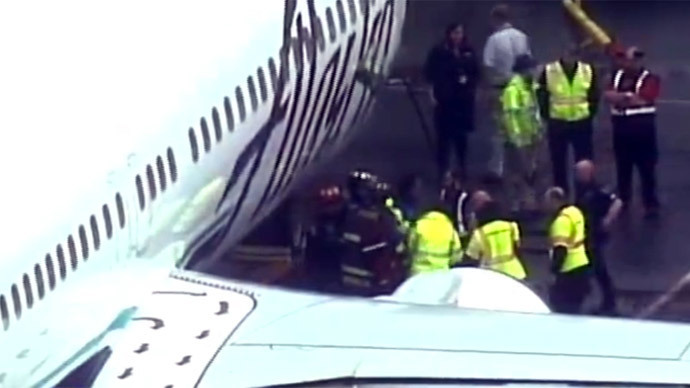 The employee was able to walk out of the cargo hold, SeaTac tweeted.